As the D.C. area endures a prolonged period of blustery cold, it's hard to believe 2017 will likely go down as the second warmest year on record. Here are some of the longest winter weather streaks in the D.C. area since 1895. WASHINGTON — At the tail end of what will likely be the second warmest year on record, the D.C. area is shivering in a prolonged period of subfreezing air. Temperatures are forecast to remain in the teens and 20s through the first days of 2018. Here are the cold hard facts on cold weather streaks in the Washington area from the National Weather Service. The longest stretch of consecutive days during which temperatures remained below freezing for the D.C. area is 12 days. In 1936 between Jan. 23 and Feb. 3, the high temperature never rose above 30 degrees and fell to as low as 0 degrees. Another 12-day stretch of subfreezing temperatures occurred in February 1895. During this episode of frigid weather, highs struggled to reach 10 degrees and lows plummeted into the single digits on six nights. The average temperature for that period was a bone-chilling 15 degrees. The measurements were taken in the District before the official observation site was moved across the river to Reagan National Airport in Arlington, Virginia. The last time the D.C. area stayed below freezing for longer than a week was back in December 1989 when the region shivered in subfreezing air for 10 straight days. The average temperature during that arctic invasion was about 19 degrees. Extended cold spells occur from time to time in D.C. but it is uncommon for the temperature to remain below freezing for a week or more. In late January 2004, high temperatures remained below freezing for six straight days. The last time the region remained below freezing for five days in a row was just last year from Feb. 11 to 15. Not all winters include consecutive subfreezing days and only about half have streaks that last more than four days. Most cold spells in Washington area are briefly interrupted by a slight moderation in temperature. Such was the case in 1961, when the temperature stayed below freezing for almost 11 days straight, but there was a brief rise to 33 degrees for a few hours on January 24. The winter of 1904-1905 was the coldest in the D.C. area with an average temperature of just 29 degrees. In recent decades, average winter temperatures have been steadily rising. 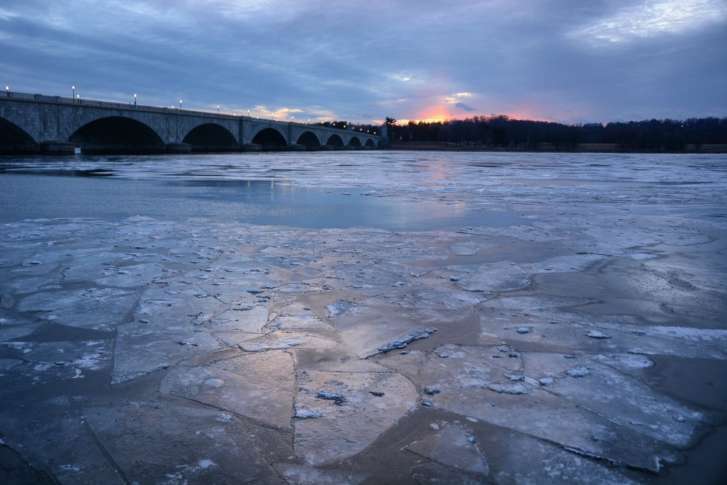 As arctic air settles into the region, ice is reaching from shore to shore across the tidal Potomac. Upriver, Whites Ferry has announced it will remain closed into the New Year because the river in unnavigable.